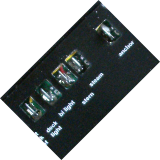 Combines switching and protection in one small unit, fly-by-wire bus bar system without the computer. Switches allow twin protected outputs, a fault on cabin lights would still maintain half lights on. 65 mm high and extremely flexible 12 volt system offering a range of circuit protection from 5 - 55 amp from a very small footprint. Provides a 135 mm high modular panel system, comprising navigation lights with mimic, plus battery level and water level on one module. 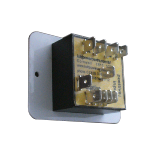 A second DC power module, has 7 options for the number of circuits from 15 - 35 circuits. Shortly an AC module will become available. Powercentre custom panels, if nothing above suits you requirements, then let us make you a one off to your requirements. Provide a range of various profiles, vertical, horizontal, square or rectangular, allowing optimum utilization of space and circuits. Panel legends are to customer requirements and backlit white, with blue on and red circuit breaker trip LED’s dots. For the last 40 years Kdd Powercentre have been developing better ways to charge batteries. 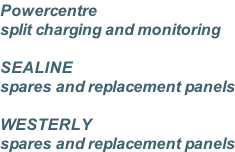 From the Patent in 1973 which introduced the portable power pack, to integrated current monitoring and protection in to-days advanced split charge systems.